I love the ambiguity of “they,” which keeps shifting back and forth between referencing the “family” that has just returned home to no home, and the “robbers” who apparently stole everything this family owned, even their tree. The tree itself had gold “on” it, though we cannot know for sure if that was before or after it was stolen (“golden” before, or only “golden” now that it’s missing, like a precious memory?). Finding the “golden” tree missing, the family calls the police, only to have the story flashback to describe the “robber” (singular), systematically going through the house and stealing everything the family owned, beginning with the blankets from the “child’s” bed. It’s like the theft of all presents and decorations in How the Grinch Stole Christmas, though here it’s more sinister — all identity is being systematically erased. When they came home their tree was gone. …. There was gold on the tree. ESTRAGON: Was it not there yesterday? VLADIMIR: Yes of course it was there. Do you not remember? We nearly hanged ourselves from it. But you wouldn’t. Do you not remember? …VLADIMIR: Wait . . . ah! The tree! …VLADIMIR: … (Silence. He looks at the tree.) Everything’s dead but the tree. ESTRAGON: (looking at the tree). What is it? ESTRAGON: Yes, but what kind? They went upstairs and took the blankets off the child’s bed. Then they went to the mother’s room and took her jewelry. They stole everything. They [the family] had no clothes to wear. They [robbers] stole the couch and the table. They [robbers] stole everything from the house. There was nothing in the house. It was all gone. They thought it was in the closet. They thought it was in the drawers, but it was all gone. Even the house was stolen and then they had to live outside in the rain. VLADIMIR: I couldn’t tell you. POZZO: It isn’t by any chance the place known as the Board? VLADIMIR: Never heard of it. POZZO: What is it like? VLADIMIR: (looking round). It’s indescribable. It’s like nothing. There’s nothing. There’s a tree. POZZO: Then it’s not the Board. They didn’t know where anything was because all the houses were there except their house. 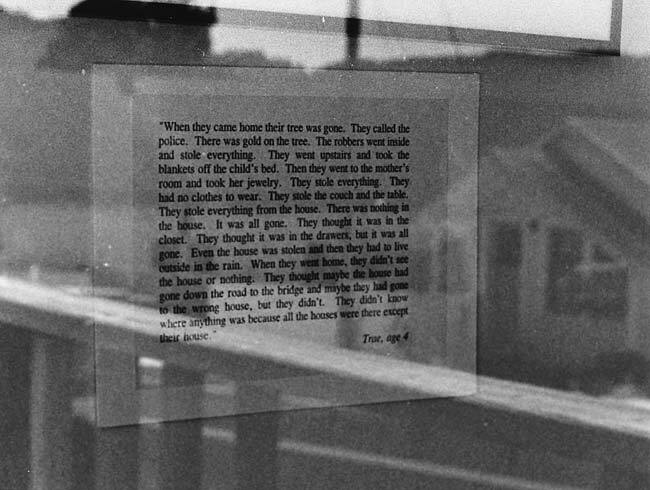 I love the photograph I took in passing all those years ago, the way the text about a missing house and tree merges with the reflection of a house and tree and street. But most of all I love Trae’s story, which was the catalyst for taking the photo in the first place. To me, this story captures pure imagination in its most dazzling essence, and serves as a constant reminder that in art, “mistakes” are often truth, rules are often at their best when broken, and anybody at any time can make the transcendent leap. Trae, if you are out there and you or your family stumbles upon this blog post someday, please contact us — we’d love to hear what you are up to. You have inspired me, and others too I’m sure, with your brilliant story. I hope you find your golden tree.